Mince pies abound in all shapes and sizes at this time of year and it never truly feels like Christmas until the first mince pie of the season has been consumed. I take mince pie tasting very seriously and am always on the lookout for new exciting flavours to try. So, for a cheeky twist on tradition, we've paired ours with a light and fluffy frangipane topping to get the party season in full swing. 1.Pre-heat oven to 185°C/170°C fan/Gas mark 3. 2.Make the pastry by placing the flour and sugar into a large mixing bowl. Use your fingertips to rub the butter into the dry ingredients until they resemble breadcrumbs. Add the egg yolk and work into the dough until it just comes together. 3.Rest the dough in the fridge whilst preparing the filling. 4.Make the frangipane: Place the butter, sugar and orange zest together in a mixing bowl and use a wooden spoon to cream together the butter and sugar until light and fluffy. Beat in the egg yolk and fold in the almonds. 5.Prepare the muffin tray by greasing with a little butter. 6.Dust a little flour onto your work surface and roll the pastry to roughly 3mm thickness. Use a circular cutter (or a wine glass!) that has a diameter slightly larger than that of your muffin tray, to cut out circles of the pastry. 7.Place a circle of pastry into each muffin hole. 8.Place a dessertspoonful of mincemeat into each pastry case. 9.Divide the frangipane between the pastry cases and gently spread the frangipane with the back of a spoon- It will find its own level but this will help prevent leakages. 10.Bake for 30 to 35 minutes until golden brown and well risen. 12.The pies are delicious eaten as is with a simple dusting of icing sugar or can be decorated by whisking the icing sugar together with a little orange juice to a pourable consistency. 13.Spoon this over each pie and top with half a glace cherry or slice of candied peel. 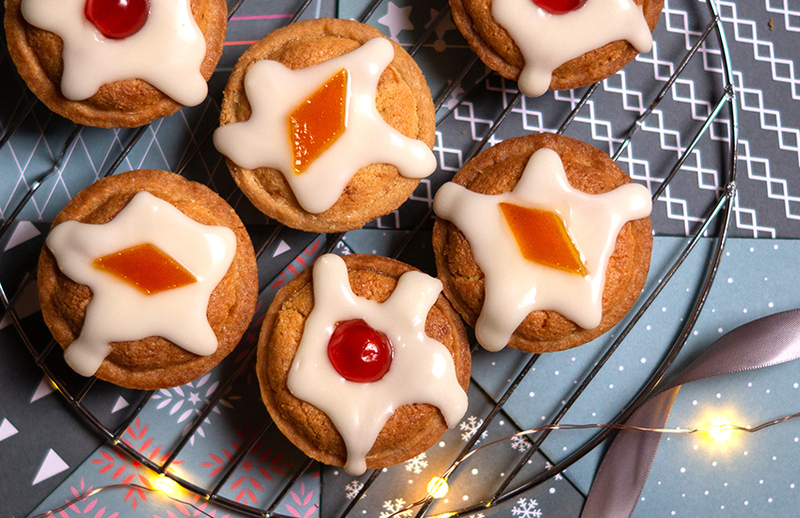 For a festive kick, add a teaspoon of amaretto to the frangipane mix! These make a great alternative Christmas pudding; why not serve them with brandy butter? The recipe calls for two egg yolks, don't be tempted to discard the whites - freeze them to make meringues at a later date for zero food waste. We will be well and truly ready for Christmas after making these! We’d love to see how you use Elle’s recipe too, so don’t forget to share your makes in the Inspiration area and to #Trimcraft when uploading to social media!